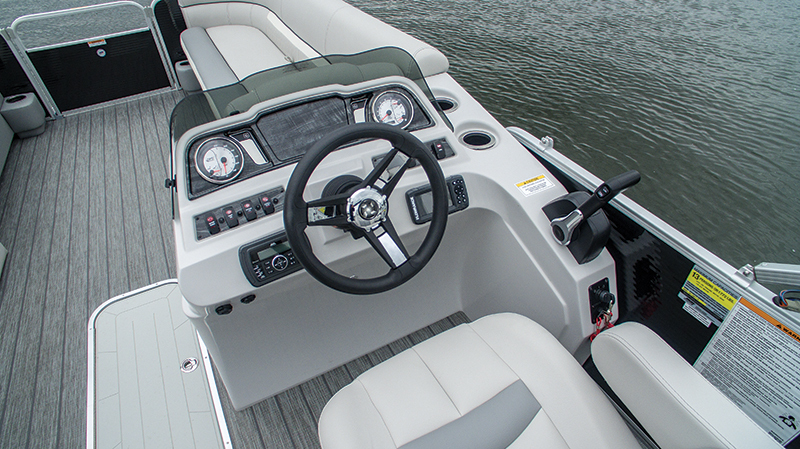 The Sweetwater 2286 SFL combines sportiness, affordability and a dash of luxury. Sweetwater is the Godfrey Pontoons Boats value line. With many other companies, value models are fairly spartan boats, but the going trend is more luxury for less money, and the Sweetwater 2286 SFL hits the mark. It’s a nicely equipped boat with triple tubes and a Yamaha F150 that costs less than $50,000. 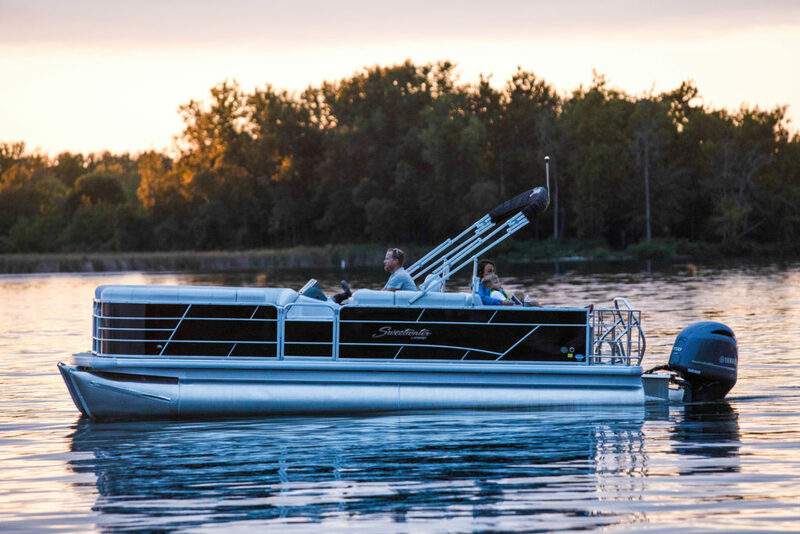 Godfrey is a company that makes extensive use of customer and dealer feedback to help its designers deliver boats such as the Sweetwater 2286 SFL. And its research indicated people wanted more room in the stern for staging watersports and for ease of passenger movement. Usually, rear-lounge configurations dominate stern real estate, but the new Single Flip Lounge (SFL) is large enough for a pair of aft-facing couch potatoes, and its location to port opens up the starboard side, which helps avoid that cramped feeling. Many pontoon boats have a changing station amidships, but it makes sense to have it near where the wet people are located, so this boat’s station is at the very end of the stern lounge, in the form of a popup changing station ($140) that can be equipped with a portable toilet ($140). The Single Flip Lounge’s backrest gives passengers the option to recline facing aft or to sit while facing forward. Because it’s integrated with the portside rear layback seat, it won’t lie flat. Though it’s an option, the stainless steel safety barrier and gate is ordered on roughly 80 percent of Sweetwater 2286 SFLs. The feature allows riders to use the rear lounge when the boat is running, and it helps contain kids. And no performance pontoon would be complete without a ski tow bar. It’s a $533 option but is required for any buyer who gets the stainless steel cage. Godfrey offers the Sweetwater 2286 SFL with a staggering 143 engine options from every major outboard brand, and they range from 50 hp to its max of 200 hp. The best engine choice depends largely on the boat’s intended use and location. 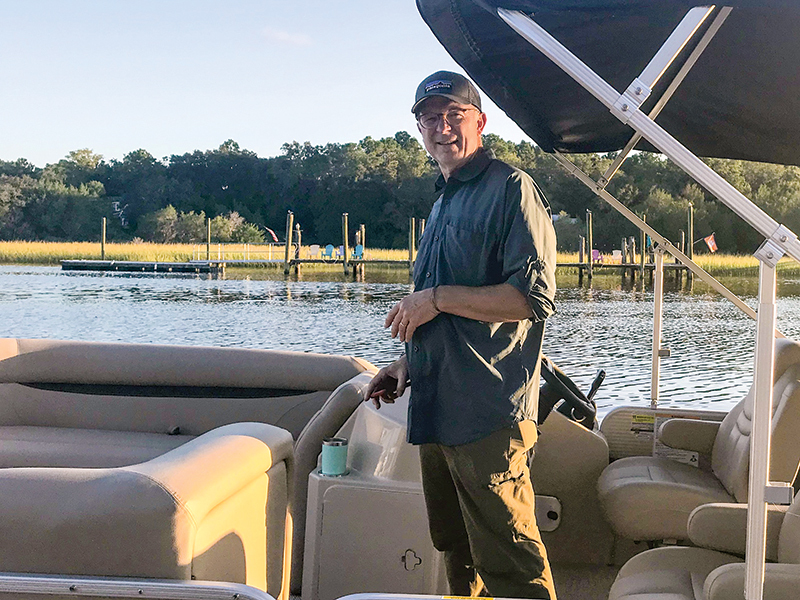 In more remote areas, where people tend to have lake cottages, there’s often only one dealer, so it makes sense to get an outboard that dealer can service and do warranty work on. Folks who do their boating on small bodies of water or on private lakes that have horsepower restrictions can get the two-tube version with a smaller motor, so they can putter about and enjoy a day afloat. To make the most of limited horsepower, it’s not a bad idea to choose a motor that’s geared to use a large-diameter prop, such as the Mercury Big Foot, Yamaha’s T-series motors or any Suzuki. 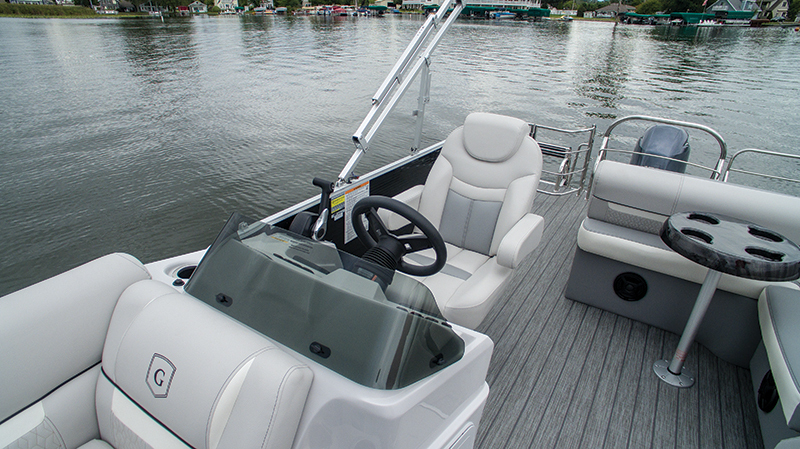 Our test boat featured the GTP 25 tube package ($4,687). It includes an oversized 27-inch center tube, 25-inch outers and four lifting strakes that give it plenty of planing surfaces for better performance. Integrated into the center tube is an engine bracket with a generous setback that doesn’t intrude on the rear deck, so passenger space is maximized. A Yamaha F150 powered our test boat and is probably the smallest outboard capable of taking advantage of this triple-tube configuration. The F150 pushed the 23-foot, 6-inch 2286 SFL well, especially out of the hole, yielding a time to plane of 2.6 seconds. Time to 30 mph was 8.2 seconds, and this mid-sized Sweetwater hit a top speed of 41 mph. Bumping up to a Yamaha F200 costs an extra $4,613, which is a little pricey considering it’s the same engine with different engine mapping, but it would put the top speed into the mid-40s. The larger center tube provides extra buoyancy, which helps it ride higher in the water and creates a pivot point for cornering help. During our test on Lake Wawasee in northern Indiana, the Sweetwater 2286 SFL experienced a fair amount of inward lean during hard cornering, which allowed it to hook up really well. With some pontoons, trimming the engine out doesn’t do a whole lot, but this boat responded well to trim and allowed us to raise the front half of the tubes clear of the water to reduce hull drag, which increases top-end speed and improves fuel economy. While most pontoon boats don’t throw much of a wake at cruising speeds, the 2286’s wake was extra flat. Instead of having a single port and starboard wake, its tube configuration created two small wakes on both sides that slalom skiers will love for their Iowa-like topography. 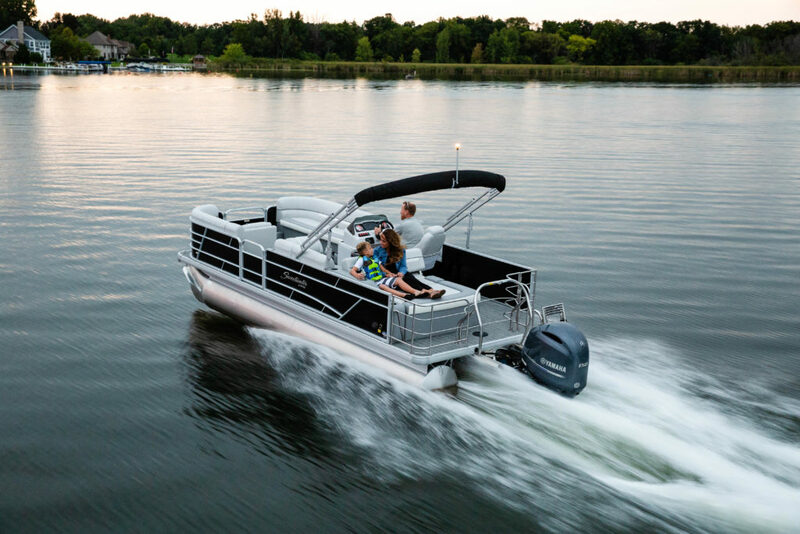 The Sweetwater 2286 SFL is a midsized pontoon boat that’s ready for just about any mission. A few simple options maximize its entertainment capabilities, including upgrading the round cockpit table to a larger rectangular model ($227). Another one just like it costs $388 and improves snack-display space. The standard stereo is a Marine Audio Bluetooth system with four speakers, but for added nighttime ambiance, a Light-it-Up speaker package costs $393. The 2286 has a capacity of 13 passengers and can seat them all, with an L-lounge in the stern, an extra-long chaise lounge in front of the helm and a slightly shorter one to port. 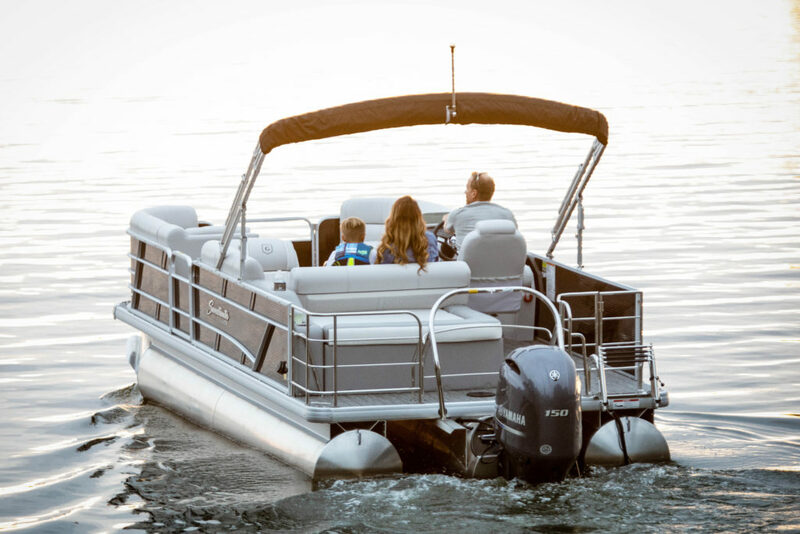 With the GTP 25 tube package and ski tow, watersports are in the picture, and there’s plenty of room for toy storage under the rear lounge. For even more room — more toys, right? — the in-floor locker option costs $1,193. The GTP 25 package also improves its cruising capability with a noise-reducing aluminum underskin and a generous 45-gallon fuel tank. The helm station features a flat panel that can hold a flush-mounted 5-inch Simrad GO5 touchscreen GPS/fishfinder ($760). Despite being one of Godfrey’s less expensive lines, Sweetwater’s new Luxe Plus Soft Touch vinyl is, like the name implies, decidedly upscale and available for $827, with either the two-tone Caramel or Slate gray. 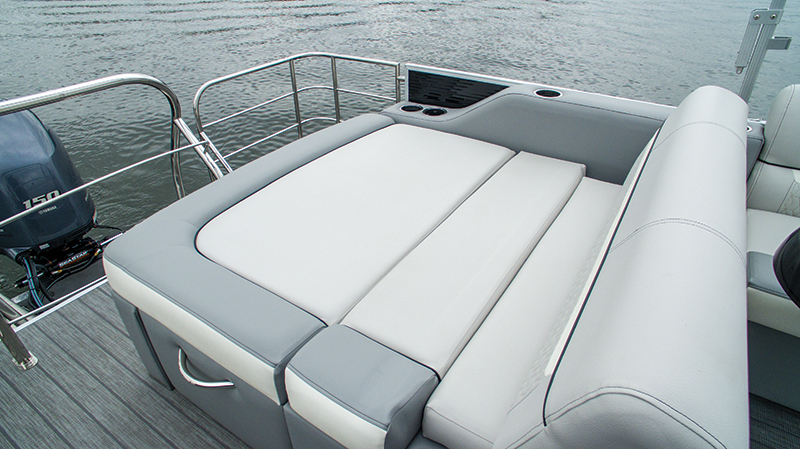 Our test boat featured the latter, which is one of the hottest “colors” going for upholstery. It features a diamond-stitched pattern at the lumbar panel, and the Plus means the base is wicker-wrapped. A Harbor Gray faux-teak woven vinyl deck adds a touch of nautical elegance for $800. This year, Sweetwater added four floor-mounted cupholders up front on select models, including the 2296 SFL. For easy cleanup at the end of the day, a bow washdown option comes with a coiled hose set into the kick panel, although the pump resides in the under-seat storage area just in front of the helm and eats up about half the storage in that compartment. Purchased by Harry and Susan Watkins, McClellanville, S.C. Purchased at Huntley Marine, Pikeville, N.C. Although it was an option, we didn’t get the GPS but now wish we had, since it’s easy to get lost in our waters. very fair trade-in for our Scout and didn’t put any pressure on us to buy. LOA: 23 ft., 6 in. Tube Diameter: 25 in./27 in./25 in. Time to 30 mph: 8.2 sec.